The Education of Augie Merasty was selected for the Saskatchewan Library Association’s inaugural 2017 One Book, One Province book club. Joseph Auguste (“Augie”) Merasty, the author of The Education of Augie Merasty: A Residential School Memoir, passed away this morning in Prince Albert. He was 87 years old. A retired fisherman, trapper, jack of all trades, and amateur boxer, Merasty rose to prominence in 2015, when at 86 years old, his first book, The Education of Augie Merasty (with David Carpenter) was published by the University of Regina Press. Merasty’s story covers his boyhood at St. Therese Residential School near Sturgeon Landing in Saskatchewan, from 1935 (when he was just five years old) until 1944. While Merasty documents the horrors of residential school, including physical and sexual abuse, his story is ultimately one of bravery and resilience, reads a statement from the press. Merasty wrote The Education of Augie Merasty while living on the streets of Prince Albert, struggling not only with alcohol, but also with prostate cancer and dementia. Over nearly a decade, he sent portions of the book to writer David Carpenter. The manuscript sat in a drawer until University of Regina Press director Bruce Walsh was alerted to its existence. The memoir’s origin story and Merasty’s storytelling prowess attracted attention across the country. The Education of Augie Merasty became a national bestseller. The National Post named it the fourth most important book of 2015. Schools across Canada have used the book to teach about the history of residential schooling. For Merasty, the book’s release was an opportunity to tell the world exactly what had been done to him and the other children at St. Therese. The Education of Augie Merasty is a lasting testament to Merasty’s talent, courage, and generosity of spirit. 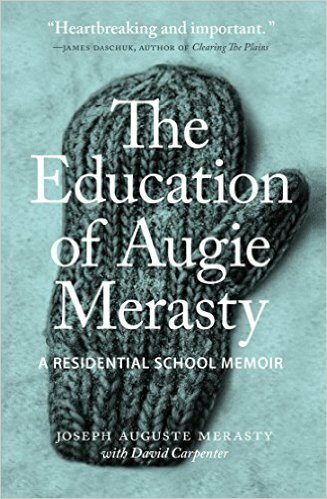 The Education of Augie Merasty was selected for the Saskatchewan Library Association’s inaugural 2017 One Book, One Province book club, and throughout the month of March schools, libraries, and other communities across the province will join together to read and discuss the memoir and the lingering effects of residential schooling. The planned One Book, One Province events this month will also be spaces for the public to pay tribute to Merasty’s life and legacy. The University of Regina Press has also just released a new edition of the book, which includes a Learning Guide that deepens the understanding of the residential school experience, and a new postscript describing how the publication of this memoir changed Augie Merasty’s life.